For Thanksgiving in 2009 we went to visit with my sister and her family in Kentucky, where we took opportunity to see the Christmas lights at the Kentucky Horse Park. If you are in the Lexington, KY area between Thanksgiving and Christmas, then this is a must see destination. The drive through lights are incredible, and there is also a ton of fun activities to do in and out of doors. This is one of the pages that I am not sure that I would do this way again – but it does show some techniques that I was experimenting with at the time. 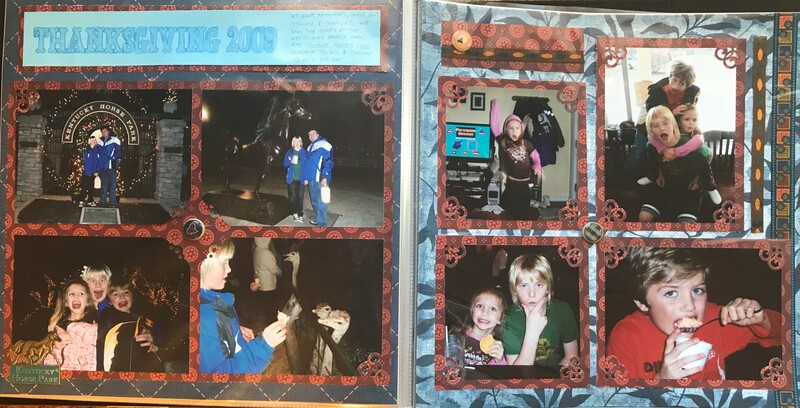 The pictures on the left hand page are of our time at the Kentucky Horse Park, and the ones on the right are of various times during Thanksgiving Break. I chose papers out of a Fall album, and what I would do differently now is to not use two patterned papers for the background and the border – it makes the page too busy in my opinion – Now I would make one of the them a solid color. You can see that I used a corner punch on all of the photo borders, and on the left hand page in the center I used another corner punch to create a pattern in the middle. For the Title for this page I decided to use my Cricut machine with the marker instead of the blade to write out the Title. I then used another marker to carefully color in the letters to help them stand out. On the right page border I used washi tape – I think that this was the first time that I had used this type of supply – what is nice about it is that it almost looks like it was printed on the page.